Our Scimitar Sword of Light beautifully captures the essence of the historic Scimitar blade! 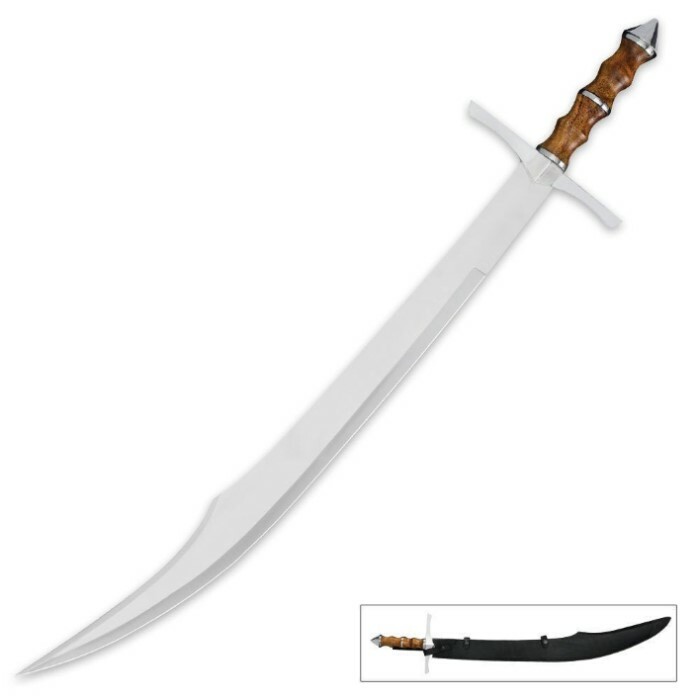 With Ottoman period roots, the Scimitar blade is known for its wide spread use across the Middle East. More recently it has become a favorite for Western based collectors as well, owing much of its success and longevity to the intensity of the blade design. The modern reproduction before you features a polished stainless steel blade, heartwood grip with lightly contoured ribbing, and matching stainless steel guard and pommel. A heavy weight leather sheath with snap closures and belt loop complete this piece. Nice sword, fairly sharp out of the box, but had about an 8 inch section of edge with burrs, quick hone job took care of that. This is definitely combat ready as a thruster and slasher. Easily the sharpest blade I've gotten blade from this site yet. VERY sharp. I was blown away. A high quality blade, ready for battle. I love it, and it's at a great price. This is the 5th sword I have purchased, and I am pleased with everyone, so far. I'm not one who normally reviews things, but this...WOW! This scimitar is beautiful. The blade is true and sharper than many I've bought for more. The wood on the handle is rich and solid. The sheath is leather that has been glued and stitched, with riveted loop and straps. It should hold up fine. I was surprised by the size, as it is larger than the photo looks. Overall, it is the best sword I've purchased so far. I'd have paid four times the price and still be happy with the value. Buy this sword...period! I am currently working on a film documentary about the Crusades. This is the perfect piece to complete the effect. It's cheap. It's high quality. It's period accurate. I highly recommend to anyone who likes history, or just collecting swords in general. Beautiful. I could not be happier with this purchase, absolutely beautiful in every way! The blade is sturdy and has a nice edge to it, and the handle is like looking at fine furniture! I look forward to showing it off to anyone who I can show it to!! MOMMA ROSIE AND I GOT ONE IN FINALLY . WE LOVE IT ! I'M THINKING THAT I'LL HAVE TO ORDER A FEW MORE OF THESE ! I just received mine a while ago, and I love it! The sword is in good condition, and i'm very glad I bought it. I have been a BudK customer for many years and have never been dissappointed in my purchases. This sword is outstanding both in appearance and quality and fulfills my expectations. Thank you for your quality products.